First off let's understand this in the definition of reparation the criminal in the case of black reparations is and has always the white institutions in the United States that promoted the crimes of racist acts of injustice on Americans of African Descent. Those vaulted American institutions include but are not limited to federal, state, county and municipal governments from sea to shining sea from eastern borders to western borders from northern borders to southern borders; it includes educational institutions that intentionally deprived children of Americans of African of receiving comparable educational opportunities to children of white Americans; in includes the financial institutions that intentionally deprived Americans of African Descent of receiving equal opportunities to financial resources available to white Americans; to those same financial institutions that benefited from the depravation of Americans of African Descent including but not limited to the enslavement of Americans of African Descent but also the invisible illegal enslavement of Americans of African Descent that was instituted after the abolishment of slavery in 1865 by the 13th Amendment; it includes all private corporate entities that gained financial benefits from but not limited to the enslavement of Americans of African Descent because it is acknowledged that illegal enslavement of Americans of African Descent promoted financial gains by such corporate giants as US Steel, J.P. Morgan, and Standard Oil Company; it also includes but is not limited to many agricultural companies and private landowners which benefited from but not limited to the enslavement of Americans of African Descent; it also every major corporation that denied Americans of African Descent employment as well as economic opportunities simply due to the color of their skin; and finally but most importantly the entire justice system of the United States that placated and upheld the horrendous treatment of Americans of African Descent for nearly the entire period of the existence of the American Constitution. So, reparations should not be considered a gift to Americans of African Descent. It is not a gift, nor is reparations in any form considered a gift. Reparation is the replenishment of previously inflicted losses by the American system to Americans of African Descent. You see in reality before the 13th Amendment was passed and ratified by the United States government and the majority of states a specific guaranteed for reparations should have been part and parcel of that 13th Amendment, it should have included the logistics of Field Order #15 that would have provided acreage along with financial enumerations to every freed American of African Descent. If not the 13th Amendment than surely the 14th Amendment that granted full citizenship rights to Americans of African Descent should have included a set-aside modeled land grant directing each state in the Union to provide land and available financial support to Americans of African Descent. Thereby Americans of African Descent would have had the ability to live in any and all regions of the United States now just the former southern slaveholding states. That provision would have forced former slaveholding whites to ensure that any facet of re-enslavement or attempts to re-enslave Americans of African Descent would have be met with a mass movement of our ancestors to lands in other regions of the United States. 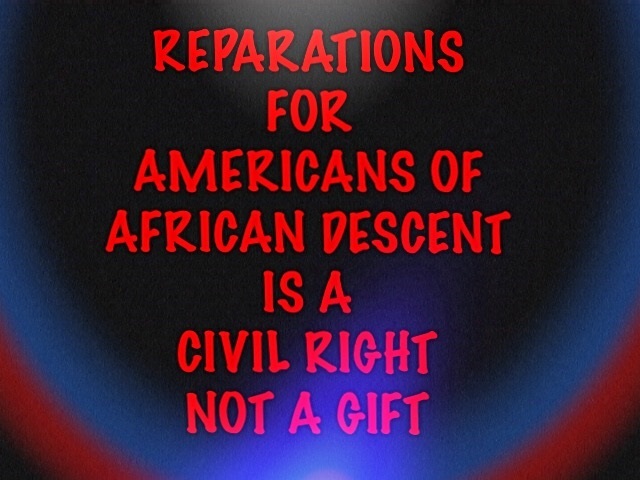 Make this clear reparations to Americans of African Descent is not a gift, reparations to Americans of African Descent is and should always been considered a Civil Right. The elements of reparations to Americans of African Descent should have been replenished with the passage of the Civil War American of African Descent Constitutional Amendments. To those who are confused let that confusion end immediately the wrongs incurred due to the horrendous, malicious, and murderous treatment of American of African Descent deserves a monetary restitution. It has been far too many years of inhumane treatment of Americans of African Descent to be ignored. The movies Black Panther, Girl’s Trip, or Thurgood Marshall aren’t REPARATIONS. Especially considering the bulk of the dollars being pocketed are sent not to the black audiences that support these ventures. 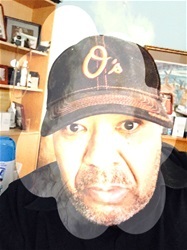 The National Football League, or the National Basketball League aren’t reparation especially considering the primary financial beneficiaries of the leagues aren’t the majority of black players who play the game but the white owners who run the teams and administer both leagues. Having a few black Hip Hop Moguls isn’t reparation especially considering the fact that these individuals are beholding to a white controlled recording industry structure that command and demands the ability to control content. Nor is the newly opened African American Museum on the Mall in Washington, DC, REPARATIONS. Nor is the Martin Luther King Monument on the Mall reparation. Reparations the direct act by this government or nation to drive the economic, educational, environmental, and judicial needle towards complete equality for the people of the darker hue. It is the actual payment due to darker skinned people who have suffered through the torment of this nation. The act of REPARATIONS is to make RIGHT those actions that actively were deemed illegal and morally wrong simply due to the skin pigmentation of the wronged individual. The systematic denial of rights for the past five centuries which has caused this widening gap of promise and possibilities for people of color in America. Until this gap of promise and possibilities evaporate. Then and only then will this nation have paid its debt to those who were denied the basic rights due to every citizen. People of color built the essential fabric of wealth that allowed this nation to prosper. The recognition of that debt must be reconciled. You cannot do that with the release of a 120-minute film, or a couple of edifices on the Mall and say the debt has been paid. So while I will support the symbolic memorials to our ancestors. I know that each of our ancestors would've wanted true economic reparation solutions, not symbolic ones. Although these memorials, films, sport figures, and entertainers are quite visible. It is an illusion to think that any of these entities exhibit the concept of true REPARATIONS. Former Congressman Conyers of Michigan has constantly introduced legislation that would research options of deciding the terms of economic reparations for people of color in this nation. He has been repelled by leaders of both political parties in getting the legislative body of government to seriously consider his legislation. They will indeed build a monument to quiet the crowd but the economic inequality produced by systematic institutional racism still remains intact. It is seemingly as strong as ever as reflected in the current disturbed racial atmosphere that exist in this nation. Martin Luther King Jr., Nat Turner, Fannie Lou Hamer, Malcolm X and every other person who fought for true equality of black people rights demand substantive payment. That insufficient economic check of inequity cannot be satisfied by a few symbolic appeasements. The payment that has been due for centuries must be paid in order for America to become the true symbol of democracy and freedom. The United Nations has even dictated that REPARATIONS are due black Americans. This issue has bounced around for almost a century and the people of color in this nation have paid a heavy price for America’s inaction. I believe the time has come for a serious discussion of REPARATIONS to come to the table of justice. What better time than now? It is only fair.